Dr. Baldwin was born and raised in Houston, Texas, but has called the Triangle home since college. He has spent time on both sides of 15-501, having attended Duke as an undergrad and UNC for his pediatric residency. You won’t see him, his wife Megan, or his twin girls Emma and Charlie cheering the Heels — they are a Blue Devil family. 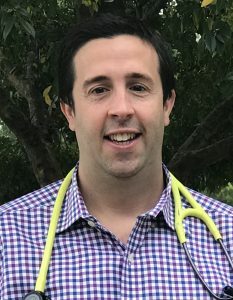 Dr. Baldwin considers himself a movie buff (he worked at Blockbuster in high school), and also enjoys jogging, biking, and swimming in his free time.